From left: Sandi Minamishin, Tanioka’s Human Resources Manager; Wendy Golz, Vice President – Tanioka’s Chairty Foundation; Jasmine Tanioka, President of Tanioka’s Charity Foundation, and daughter of Mel and Lynn Tanioka; Jerry Correa, St. Francis Healthcare System’s CEO; and Esther Ringor, Tanioka’s Seafood & Snacks Manager. The two 19-inch monitors will serve as amenities offered to St. Francis Healthcare System’s hospice patients staying in nursing homes in the community. 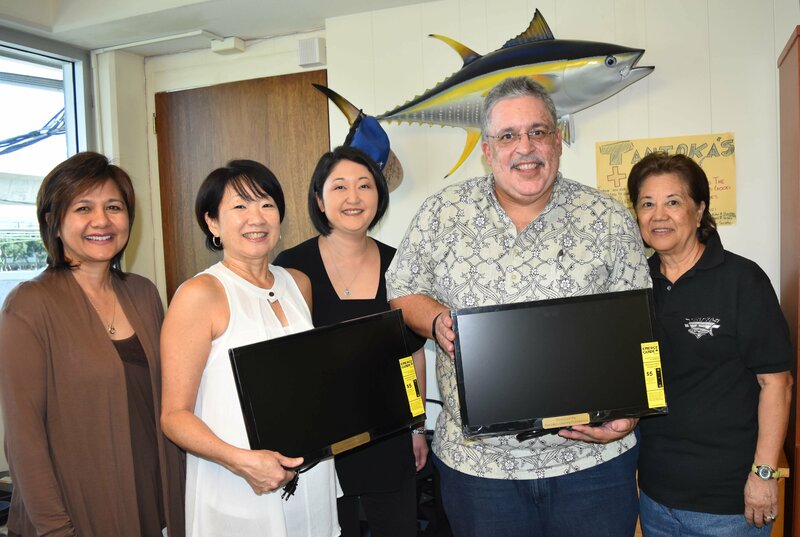 Tanioka’s Charity Foundation recently donated two 19-inch monitors to St. Francis Healthcare System that will be used for hospice patients who are receiving care in nursing homes. St. Francis Healthcare System provides hospice care in the homes of patients, at its inpatient hospice facility in Nuuanu, and in nursing homes throughout the community. Often, patients who are at nursing homes are required to bring their own televisions, and the monitors will be used to meet that need. Mel and Lynn Tanioka, who founded the award-winning food service company in 1978, established Tanioka’s Charity Foundation as a way to give back to the community by supporting various nonprofit organizations. Known for their fresh poke and other signature okazu-style delicacies, Tanioka’s serves Hawaii’s families at its store in Waipahu and through islandwide event catering. Through hard work and dedication, the Tanioka’s started from a small, 1,000-square foot space and today own two commercial buildings with more than 16,000 square feet of space and more than 150 employees. Last year, Tanioka’s was named Retail Business of the Year for Oahu by the Hawaii Restaurant Association, received the Ho‘okela Award Retailer of the Year for Oahu by the Retail Merchants of Hawaii, and was ranked on Yelp’s Nationwide Top 100 List.